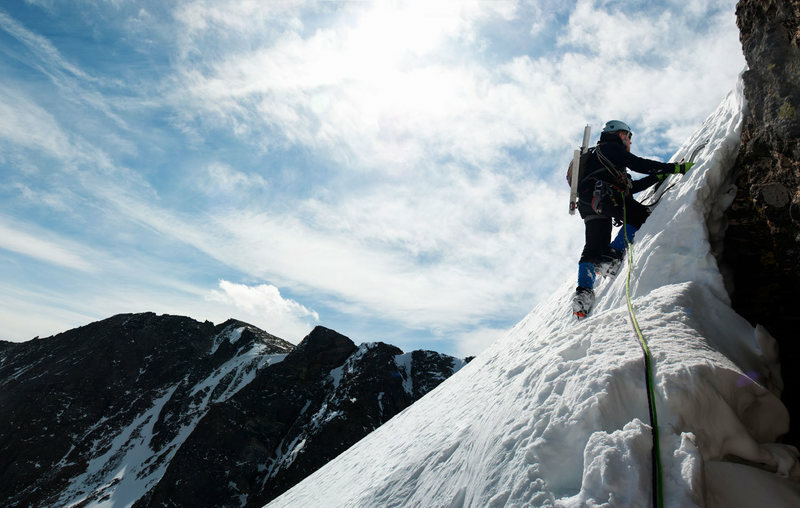 Begin at the very highest point of the snowfield and climb a couple pitches trending left toward the ridge. Traverse back right and into a bowl. Trend left then follow the obvious relief toward the upper bowl and skyline notch. Frozen Spring conditions may be best. Ken Younge & I did it in early April 2002. We were several hours late and post-holed in knee deep slush. Styrofoam type frozen snow would be ideal. Ascend the talus from Sky Pond and head left (west). Get on the snowfield and continue west to it highest point. A light alpine rack. (A picket or 2 may be helpful in frozen spring snow conditions). I did this route on March 18th 2012. 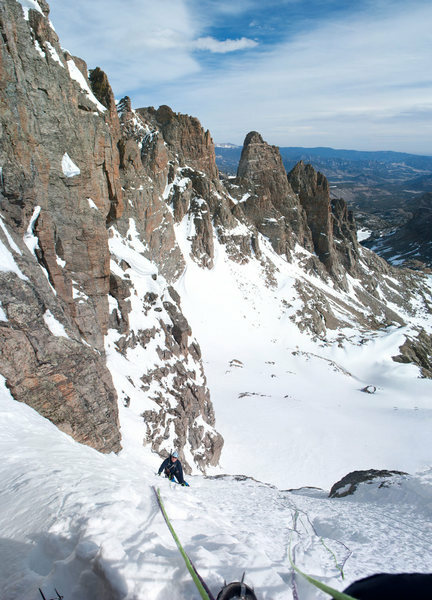 It has to be one of the classics of Rocky Mountain alpine climbs. The position is spectacular. 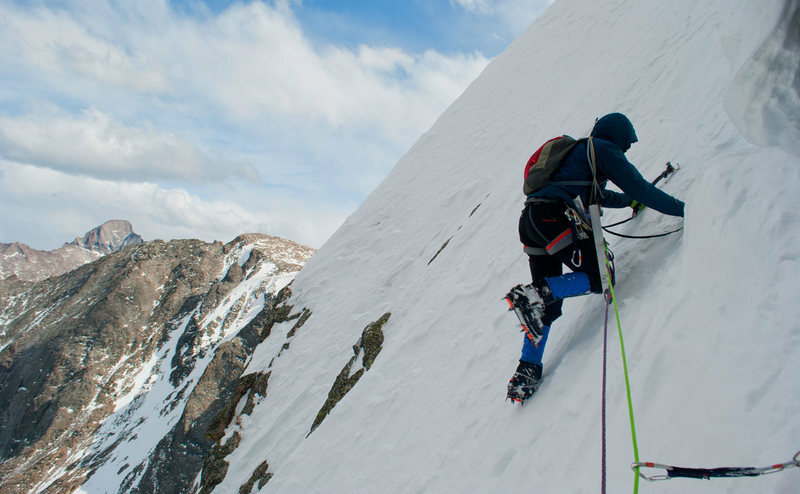 The opening moves on the first pitch are spicy M4, followed by steep snow. The 3rd pitch is also mixed at challenging M4 to gain the upper snowfield. The upper snowfield pitches are incredible. Be sure to take a couple of snow pickets for gear on these pitches. The upper snowfield goes into the shade after about 1 pm in March, so the snow does start to consolidate in the afternoon. On the walk in to Taylor Peak, March 18, 2012. Climbing the snowfield on pitch 1. Climber: John Christie. Starting out on the second pitch on Quicksilver. Climber: John Christie. Starting pitch 6 on Quicksilver. This is the last pitch up the upper snowfield which is three 200ft pitches in length.